California State University-Los Angeles got an expensive lesson in constitutional obligations when it allowed a near-riot against a conservative speaker two years ago. As a result of the First Amendment lawsuit filed against the taxpayer-funded institution, it pledged to follow its own free-speech policy that vows to treat speakers in a viewpoint-neutral manner and remove disruptive protesters from such events. 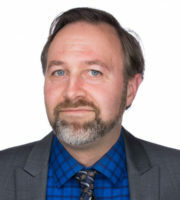 The target of their ire is Kristan Hawkins, the president of Students for Life of America, who is speaking on “the injustices of abortion” in the LA Room in the Student Union building on campus on Tuesday. Young America’s Foundation is sponsoring the event. The anti-choice agenda being pushed by Trump/Pence and their fascist movement is nothing less than preparing for the ground for a real-life “Handmaid’s tale”, with women completely enslaved and subordinated to a patriarchal order. NO! We refuse to accept this! Refuse Fascism will join all who despise this fascist agenda and unite with everyone who recognizes the grave threat to all women – and to everyone – that this fascist movement represents. In the name of humanity, we refuse to accept a fascist America! Drive the fascists off campus AND out of the white house! Hawkins is speaking the next day at CSU-Fullerton, and the day after at UCLA. Refuse Fascism has pledged the same action at CSUF – “Look for the black and white NO! signs” – and UCLA. A spokesperson for SFLA told The College Fix in an email that the UCLA and CSUF events are being hosted by those campuses’ Students for Life chapters. Since an outside organization like YAF isn’t sponsoring those events, “The only bill is travel and lodging, which we basically cover and then when [student] groups can, for example get funds from student government, they pitch in” to help with Hawkins’ expenses, the spokesperson wrote. Young America’s Foundation said in an email blast Wednesday that since the near-riot against Ben Shapiro in 2016 (below), which led to YAF’s lawsuit against CSULA, the conservative student organization has successfully hosted several other conservative speakers at CSULA without incident. Since Young America’s Foundation lawsuit again California State University, Los Angeles in the wake of their unconstitutional attempts to stifle the YAF lecture with Ben Shapiro, CSULA has had to enforce their free speech policy without regard for viewpoint. This proves again that when bold conservatives fearlessly work to advance their ideas, they can ensure their rights are protected, as well as the rights of anyone else on campus. YAF and CSULA Young Americans for Freedom “call on CSULA to hold accountable anyone who attempts to disrupt the lecture,” Brown said. Read Refuse Fascism’s plans for disruption at CSULA and CSUF. UPDATE: Students for Life of America responded to questions about Hawkins’ other appearances in California after this article was published. 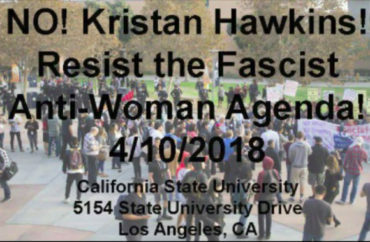 Information has been added about another speaking engagement at UCLA and protest of that event by Refuse Fascism.